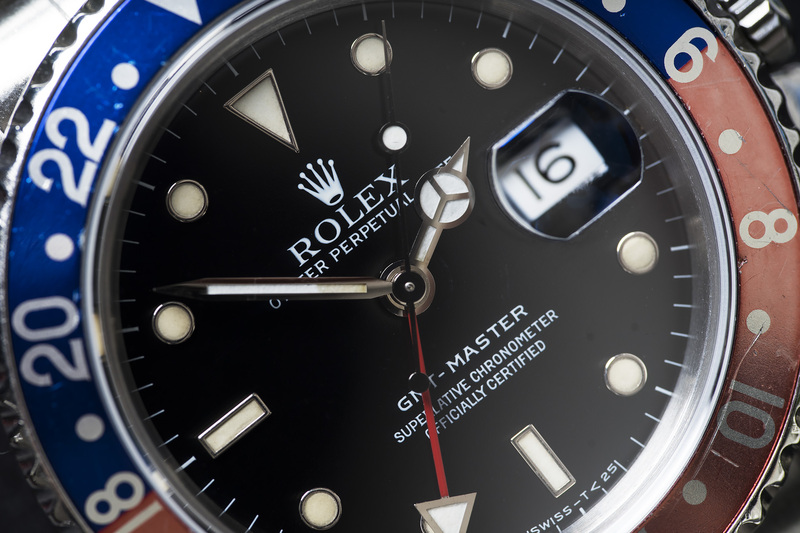 Another very attractive Pepsi GMT made its way to our website. This time its an early reference 16700 with a wonderful glossy dial and warm eggshell patina on the white gold surrounded Tritium indexes. Combined with its nicely faded inlay, you’ll get the best of both worlds with this 16700 GMT – a warm vintage appearance with modern technologies like the sapphire crystal and a case design that was new to the 16700 when it was introduced to the public back in ’88. 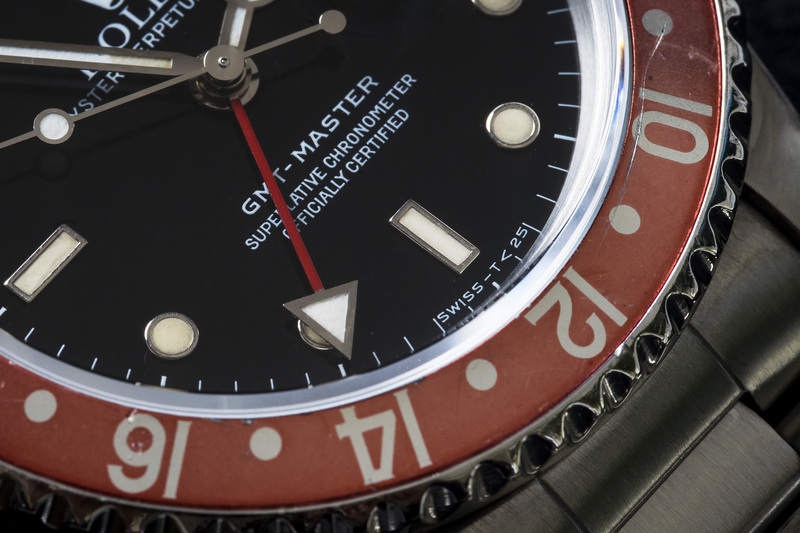 This GMT started his wrist career in South Africa so we’ve got the African sun to thank for those nice discoloured Tritium markers and pinkish faded inlay. As you can see the hands are more white than the indexes but with a partialy discoloured minute hand. All of the hands are still Tritium but could possibly be from a slightly later period. 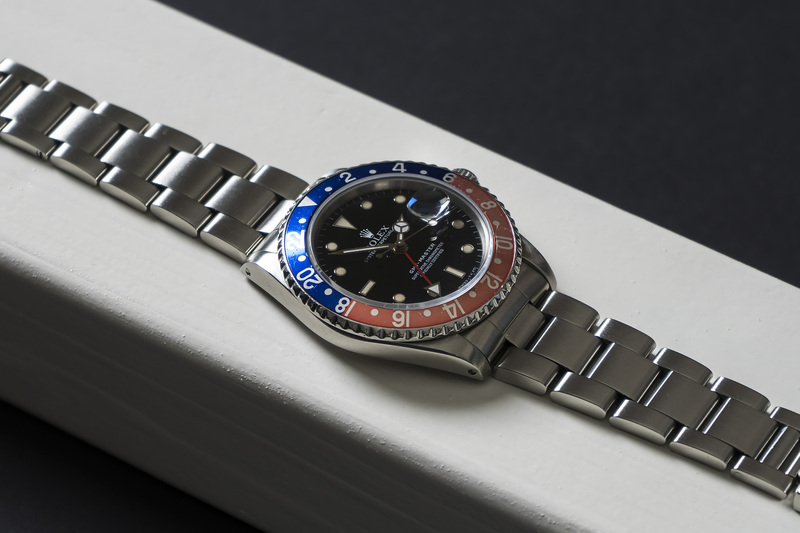 The 16700 was introduced to the market back in 1988 and was in production until 1999. 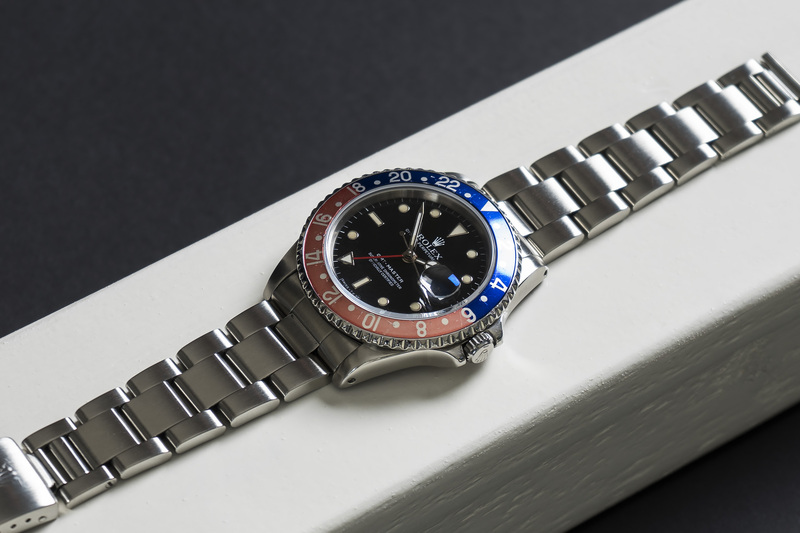 Our GMT was manufactured in 1991 and was used as a true Toolwatch, there’s something about a watch like this where you can see it’s been through some stuff and was actually used what it was intended for – an everyday watch that can take a beating or two! The killer Pepsi inlay is still the original one with a beautiful and rare serif font on the numbers. The blue on the inlay has just turned to a slightly lighter tone, but the red has a a beautiful pinkish glow. 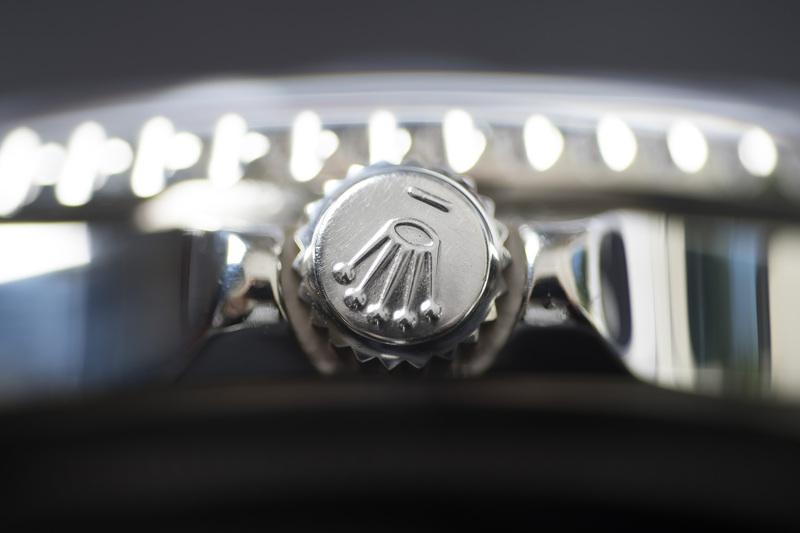 The watch is fitted on its original 78360 Oyster bracelet with 501B end links. When we bought the watch is was barely moving and had a worn out tube. 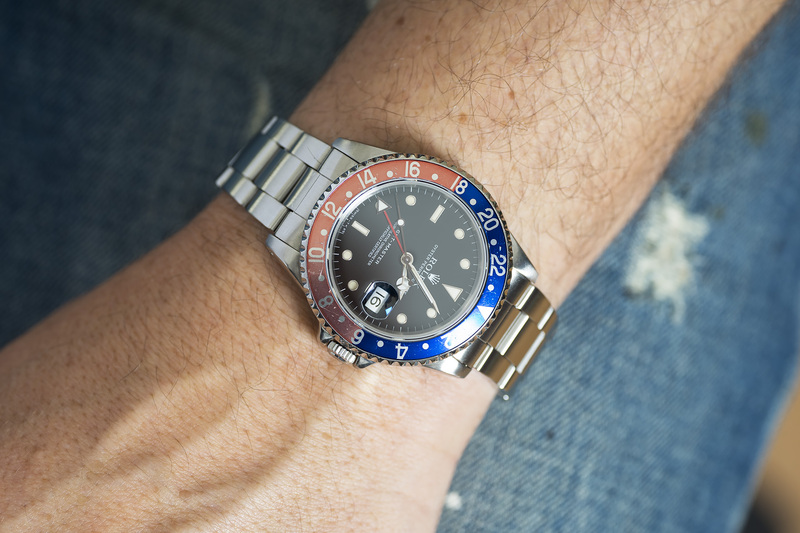 But after a full overhaul this GMT Master is ready for a new, and maybe more relaxing second life! I’ve got a feeling the new owner will be a bit more careful with this beauty. As mentioned above the entire watch and movement have been fully serviced and naturally the watch will be sold with a twelve month warranty.